For starlet Elizabeth Sutton, it’s difficult to tell which has more momentum: her burgeoning film career, or the growing intimacy in her forbidden romance with notorious Hollywood outsider, Aidan Evans. When the opportunity to costar in a feature film arrives, Beth and Aidan fight to keep their relationship out of Hollywood’s rumor mill and away from the ever-watchful eyes of Starlight Studios head Luther Mertz, who condemns a union between them and threatens the future of Beth’s acting career. The pressure mounts as the cameras roll. Beth and Aidan navigate the precarious heights of superstardom while exploring their physical desires in secret. Beth grapples between the debilitating nervousness over her sexual inexperience and her unbridled need for Aidan. Meanwhile, the demons from Aidan’s past he thought forever vanquished linger on the fringes of a fragile inner peace . 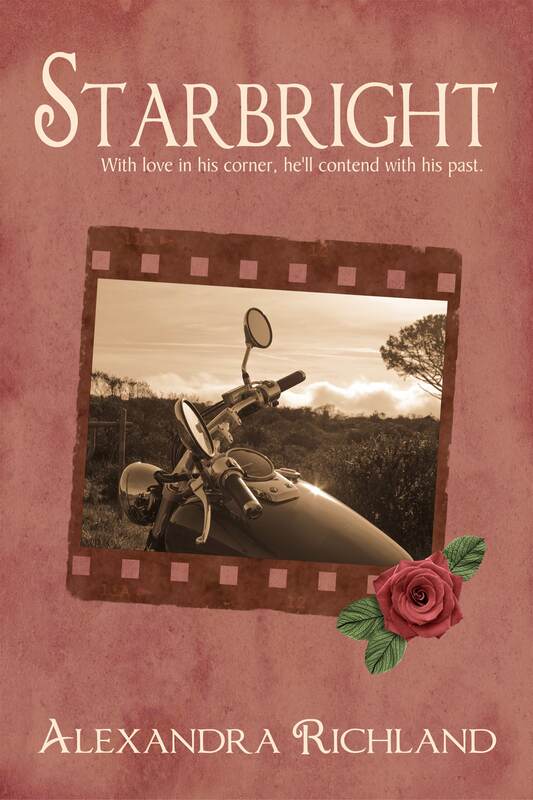 . .
Starbright is the second book in The Starlight Trilogy, a story of love and redemption set against the backdrop of the final years of Hollywood’s Golden Age. With a shudder, Beth stepped onto the covered front stoop and tapped the brass knocker against the door. Several moments passed without a response. She knocked again. As Beth turned to leave, she heard the lock disengage. The front door opened wide. Aidan stood in the entryway, his eyes dilating with the shock that electrified his handsome features. But it wasn’t his face that Beth focused on. And wearing only a towel. Now, Beth knew Aidan was in fine physical shape, but she was completely unprepared for her first view of him in the flesh. Suddenly, the idea of an Adonis on Earth, as described in Connie’s romance novel, didn’t seem farfetched at all. Aidan’s smooth skin glistened with the droplets of water that beaded as they slipped between his bulging pectorals and down his rippled stomach. A faint dusting of light brown hair trailed from his bellybutton and disappeared below the thin white towel wound around his hips—very, very low on his hips. Thunder exploded in competition with the sound of her frantic heartbeat and the rain pounding the steaming sidewalks and asphalt. Beth jolted from her trance, suddenly aware of her drenched appearance: how her hair plastered to her head and her dress clung to her like swimwear instead of respectable evening attire. Most embarrassingly, how she was ogling her beau in the same manner Betsy ogled Fabio in the book. But she wasn’t the only one staring. Aidan’s eyes traveled up her body, pausing noticeably on her breasts before coming to rest on her face. His throat constricted with a hard swallow, his smoldering gaze outshining the lightning that blasted across the sky like fireworks. Beth worried she’d arrived at the wrong time, although she couldn’t say she regretted it. 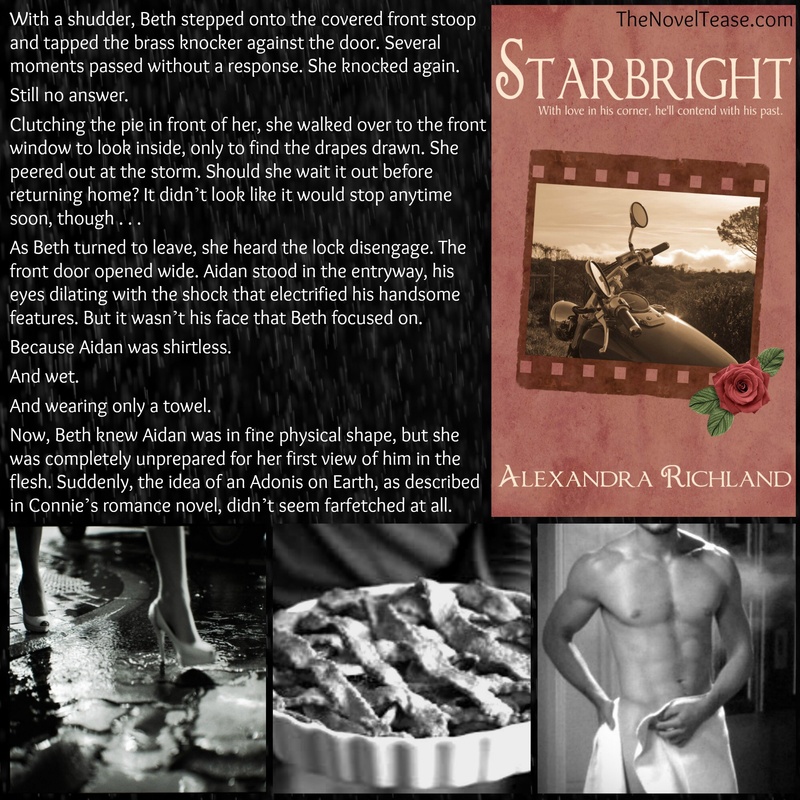 With Aidan standing half-naked before her, she didn’t need the sweet taste of apple pie. She already had her own slice of heaven. Alexandra Richland spends rotating twelve-hour shifts working as a registered nurse at a Toronto hospital, indulging in her love of science and medicine, and caring for patients with their own unique tales to tell. When she is not on duty, Alexandra escapes into her own imagination. Therein lies a fantasy world of thrilling adventure, gorgeous men, classic Hollywood glamour, exotic getaways, and a seductive dose of romance. 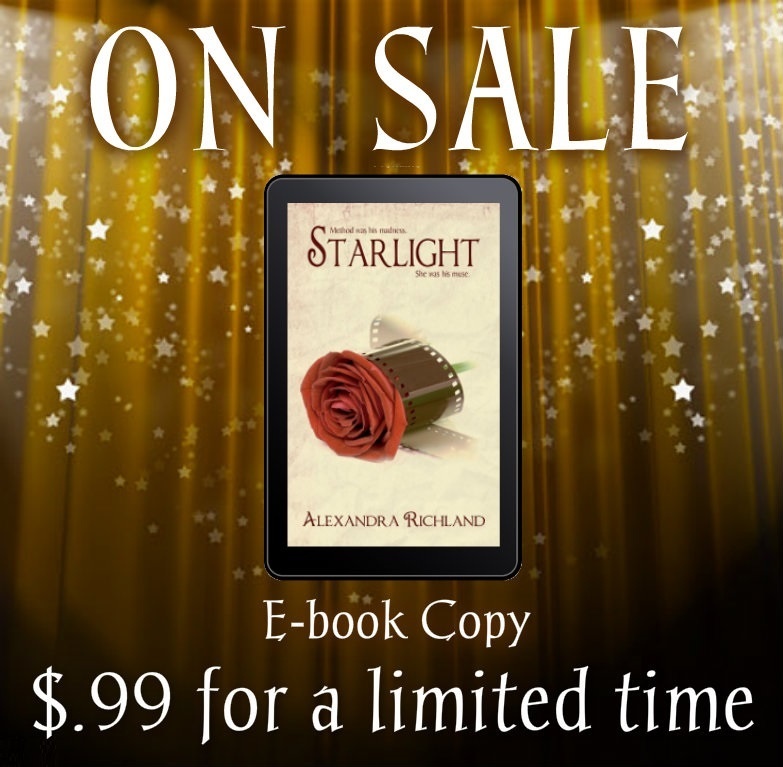 Alexandra captures these stories in her popular novels, The Starlight Trilogy and Frontline, her novella, Slip Away, and her short story, Gilded Cage.